We were sad to see the name Schadenfreude here as we realize that this will be one of the last of his that we solve. We knew that it would be a polished compilation and the succinct preamble already suggested to us that there was going to be some clever final manipulation of the grid, relocating a couple of titles and retaining real words. Of course Schadenfreude was a long-standing member of the Listener Setters’ Oenophile Elite and he gave us ‘See sad vagrant drink plenty (5)’ No problem with that: we extracted the drink and put LO with SAD* giving us LOADS so here’s raising a glass to Schadenfreude. It was an unusual grid, 11 X 13, and that suggested to us that the titles were probably going to appear symmetrically across the grid. It wasn’t long before we had IN LOVE AGAIN, which suggested ‘Falling’. I had to consult Google to find a singer of that song whose name added to fifteen letters and there she was, MARLENE DIETRICH. That device of an extra word that only shared a single letter with the entry was a lovely change from ‘extra letters in the wordplay’, or ‘misprints in the definition part of the clue’ and we enjoyed finding Marlene’s letters when, for example, HENT was paired with NOW, producing the N.
The grid filled steadily and it was soon clear where ‘IN LOVE AGAIN’ had to fall to but it took me a little longer to see ‘SAGITTARIUS’ which was ‘rising’ to fill its place, and again, Google had to tell me that it was CECIL LEWIS who wrote that. We had nine of his ten letters and had the last C to confirm. ‘Free export custom (6)’ gave us EX + USE and we entered EXCUSE. 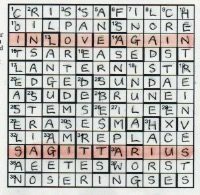 There was the C.
I love the moment in a crossword when we perform the end-game and find ‘all real words’. 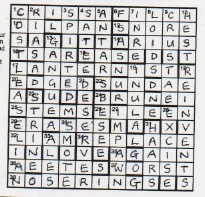 We cannot ask Schadenfreude how he created this puzzle – whether he had a laborious hunt for two titles that would exchange places but the fact that he was obliged to use words like INGE, BRUNEI, AEETES, LIAM and EILEEN suggests that it was no easy task. It was certainly a fine achievement. This entry was posted on 12 April 2019 at 4:00 pm	and is filed under Solving Blogs. Tagged: Cecil Lewis, Marlene Dietrich, Titles. You can follow any responses to this entry through the RSS 2.0 feed. You can leave a response, or trackback from your own site.